Left early again before any of the caravans or campervans had departed. Light traffic all day as I continued westwards to Victoria River. Initially, the landscape continued as wooded with gentle rises and falls as I crossed between drainages. After 20 km was a turnoff to Willeroo station. A good herd of cattle standing around a muddy waterhole. My "Western Water Stops" listing indicated the cattle tanks as one possibility, though I'm glad I didn't have to contend with cattle, barbed wire and the tank to get a drink. At 50 km, the terrain became more interesting with small bluffs, buttes and mesas. The road wound through, over and around them. Another 10 km and a sign indicated Gregory National Park. I rode through and around the bluffs and crossed a wide Victoria River to the roadhouse by lunch time. Overall, a fairly easy ride. Only caution is I'd been hearing a ticking that I couldn't identify. Will have to investigate further. In the afternoon, looked further at the Victoria River Roadhouse. It was under brand new management as of a week. When I asked about faded "new management" signs that indicated this was from previous new managers, three years before. 91 km today, 11116 km cumulative. Beautiful scenery today. Route started by following the Victoria River canyon with nice sandstone walls on each side and early morning light. After 10 km, left the canyon and into more open countryside. However, an escarpment was still visible to the left. Saw four kangaroos today and many flocks of birds. Spear grass, eucalyptus, and other savannah plants along the way. The route crossed several small creeks, most of which were dry. Those that weren't dry didn't look too appetizing to drink from. Calm winds and good gliding meant I made good time again. Victoria River was 10-15 km to the north as the route went across the drainages. At 62 km, sign for a lookout and a turnoff to an outback unsealed road to Top Springs. From the road junction, the road had a surprising amount of downhill in the last 29 km. Where did all this elevation come from? I wasn't complaining as I made my way past a monument to early cattle ranching and then into Timber Creek around lunch time. Timber Creek was a small town with two caravan parks, a store and two pubs. Still, the town was small enough that the "welcome" and "come again" signs could share a post. In the afternoon, took a sunset boat tour on the Victoria River. The Victoria River is wide here, some 100 km from the sea. Still a tidal area, with brackish water. Saw at least 11 crocodiles, 2 jabirus and 50 wallabies. Otherwise, a fun boat ride. 91 km today, 11207 km cumulative. Pretty ride along the Victoria River for the first 10 km. Passed Big Horse Creek campground and site of the boat tour from the preious night and then the road left the river. Two wallabies hopped along in this first part. Trees changed today. Many more boab trees with their big wide trunks. Less eucalyptus and more scrubby looking trees. Otherwise, similar with dried spear grass. After leaving the Victoria River, more open country though the last 10 km got close to escarpments again. After 30 km was a cairn to commemorate the Gregory expedition. In contrast to some of the later disasters, the Gregory expedition was a success in exploring the country, animals and plants. At 57 km stopped at a rest area and refilled on water. As I was leaving, met another cyclist who had come from Longreach to Halls Creek via the dirt tracks, considerably tougher than sealed roads I was taking. From the rest area, continued riding until my stopping point for the day. Quite a few caravans stopped, so I expect it to be a busy evening for camping. This is the last rest area before the Western Australia (WA) border. Also, the last "green tank" that I'll see for water. There is a quarantine check at the WA order and no fruit, vegetables or honey may be brought into WA. Made certain I finished mine, though others have been walking around the last few nights trying to give away vegetables. Lunch was light: fruit, a bag of Scottish shortbread crackers. When I checked later, ants had found the crackers. An impressive line of ants marched up the picnic table, across my bike panniers, up my daypack and inside to the shortbread bag. The entire first cracker was red with ants. Sigh. 117 km today, 11324 km cumulative. The ants ate much of my dinner and breakfast, so I had less. Met some of the caravaners the previous afternoon. Early departure again. The moon is waning and only half full, so not as bright starting out. Rest area had been amongst some rock escarpments and I followed those for 10 km before going into flatter country again. The landscape continued with a mixture of boab and other trees. It was open range with several grids (cattle guards) to cross. Unfortunately, saw two road kill cows today, one recent. After 45 km, came past Newry Station and then another 20 km further was a turnoff to the Duncan Road. This back road had no petrol for 441 km. Another 11 km further was the WA border. Hooray!, nice to reach the border. Here was a quarantine station. They checked everyone's food containers for fruits, honey and vegetables. Mine was a quick check as the cupboard was mostly bare. Also at the border was a 90 minute time change. WA is sparsely populated with 10% of the Australian population living on 30% of the land. Of those, 80% live in the Perth area. The overall area is 3.6x larger than Texas at a 10th of the population. After the border, nice scenery as the road climbed over and past some dramatic rock outcroppings. Not much further was a turnoff to Lake Argyle. This lake is a reason for much of the settlement in the area as it enables irrigated agriculture. After the turnoff, I quickly rode the last 35 km into Kununarra. Kununarra is a small town with shops, motels, restaurants, etc. Surprised at the number of small-scale internet cafes, typically only one or two machines in addition to the normal business. Chance to stock up again on provisions for the next section of open road. 111 km today, 11435 km cumulative. Scenic cycling today. Enjoyed riding around bends in the road just to see new vistas open ahead. Otherwise a short easy ride. I stayed on the same time relative to the sun, but with the time change it was 5:30am starting out. Tourists out waiting to be picked up for day trips (Kununarra seems to have many tour operators, particularly for water activities: canoeing, Lake Argyle boat trips. Also scenic flights and longer treks). Went past a lake and then over a diversion dam. The route climbed over a small hill that provided a beautiful look back over town and the dam at sunrise. The route wound back down the hill and then past a low range of hills. Several side roads with "Danger Mine, Authorised Entry Only" type signs. At 30 km was a mine site that seemed to invite tourists. I rode in and investigated. It seemed to be mostly rocks and old junk on tables. Some more hills to wind around and then came to the Wyndham turnoff, 56 km from here is the town of Wyndham. From Wyndham, one can take the Gibb River Road, a gravel road that is a shortcut by several hundred km over the route I'm taking. Caravaners I'd spoken with indicated that parts of the Gibb River Road were severely corrugated and that they were still cleaning dust from their caravans. I decided 650 km of gravel road could wait for another trip. From the intersection, the route turned southwards and along a low range of hills. A few stations along the way. After 20 km was clear flowing Arthur's Creek. Not too much further was the Dunham River and rest area. Stopped for an easy day, since this was the last place I could rely on water before Turkey Creek. Saw more of these tiny ants again. Not certain if I'd brought them along as that morning I'd found some in the lid of my water bottle. After lunch a couple cycled up. They were from near Port Macquarie and were riding from Katherine to Perth. Except for some rest days, they'd had the same stops as I. Today however, after a rest, they would continue another 20-30 km. I expect we'll meet up again. In the afternoon, four British backpackers drove up in their campervan. They'd worked in Perth for several months and were now driving a big "s": Perth, Darwin, Adelaide, Sydney and ending in Cairns. They were happy to have only paid $AUS 650 for the van. On their departure, this van wouldn't start. Fortunately, we were able to push start it and get it going again. A number of vans/caravans staying overnight. I learned more about Australian labor laws from a couple touring from Tasmania. 81 km today, 11516 km cumulative. Warmun is the (new) aboriginal name for Turkey Creek. There is a roadhouse, motel, caravan park and not much else here. 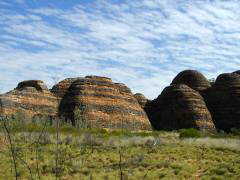 Helicopter flights take off for the "Bungle Bungles". On the road early again. Mid-day it has been hot, but early morning is nice and cool. More gentle climbs and descents today as the route continued past low ranges of hills. Came into generally drier lands, with boab trees mostly confined to creek bottoms. Many of the river crossings including the Dunham River had one lane bridges. The road would narrow with signs warning of oncoming traffic. After 10 km, a gentle climb for several kilometers and then through a pass into a new valley. Overall, crossed into several valleys today. Past the "Doon Doon" station. Signs warned here about "no alcohol consumption". Apparently, some of the aboriginal communities have been policing alcohol problems by going dry. I caught up with the other two cyclists who had camped 25 km further and were riding slower than I. Rode together for a while and then agreed to meet at the next rest area. Bow River was at 85 km. In hindsight, this was where the rest area was located, but I missed it as I passed. It started getting warm as I rode the last 30 km to the Turkey Creek Roadhouse. The new name for Turkey Creek is Warmun. This is also a declared dry community. Booked for two nights here in the budget accomodations. Lots of through traffic stopping all afternoon. 115 km today, 11631 km cumulative. Have you seen the Bungles? Over the past week, I'd had at least half a dozen recommendations that the Bungle Bungles were a place not to be missed. Today, I took a tour with East Kimberly Tours and explored a little. Trip left at 5:20am. Our guide, Martin, picked up seven passengers in his suburban and off we set. First 50 km down the rood, zoom. Here a 4WD road went eastwards through Mabel Downs Station for 53 km to Purnululu (Bungle Bungle) National Park. Lots of corrugations and half a dozen water holes to cross. Wouldn't have been fun to cycle, though better than the Twin Falls Road. We had a brief stop for morning tea and a stop at the visitor center. Here we could see the Bungles, which is an area of 30 km by 25 km that is uplifted up to 200 meters from surrounding areas. It has then been eroded down in very interesting ways, including the classic beehive bungle shown top left. The southern portions of the area are sandstone with northern portions more conglomerate. Our first stop was Echinda Chasm in the north. We took a short hike that followed a stream bed into a narrow gorge. At places, less than a meter wide, but towering at least 50 meters above us. It was fun to follow this narrow twisty passage through the rocks. After Echidna Chasm, a short walk to an overlook and then back south for lunch. East Kimberly Tours maintains a permanent camp here, particularly for their overnight and fly-in traffic. After lunch, a drive to south end of the Bungle Bungles and Cathedral Gorge. This part of the Bungles is sandstone, mostly striped in very distinctive red/gray pattern. Reddish areas are rocks with iron oxide coating and gray areas have blue-green algae coloring. Some of the more distinctive patterns are known as "beehives", both for their shape and coloring. Our walk to Cathedral Gorge took us through this area of the Bungles and into a small gorge. At end was a high amphitheatre area with large pool and high walls. Great acoustics! After walking out of the gorge, we unwound back to the road with a stop for afternoon tea and a slow 4WD back to the main road and then to the roadhouse, about 14 hours after starting. Enjoyed the trip and glad I took a little time out to see the Bungles. Fascinating country! Winds during the day were from the south, so didn't mind missing some headwinds either. 0 km today, 11631 km cumulative. Today rode through generally drier lands. Still trees, but they were sparser. Light winds from E and SE, so occasional head winds, but also occasional tail winds. More cattle along the way, including a few I spooked as I was riding. High thin clouds and southerly winds kept it cool today. Martin was loading the East Kimberly Tour vehicle with his next batch of tourists for the Bungles. For the first 53 km, I followed our driving route from yesterday. Four or five places where the road narrowed to one lane to cross a bridge. At 40 km, Fletcher Creek was running over top of the road. Fortunately, only a few cm deep. At 60 km, the Ord River was still running well. This fall had been wetter than normal. Halls Creek also got a storm with 7 mm of rain about a week ago. Hence, more water in the creeks than normal. The Ord River had a nice rest area and would have been a good place to camp, but decided to push on for a long day ride to Halls Creek. Followed the drainage from the Ord River and then a climb at 80+ km. Dry landscapes with fewer rock outcroppings. Came up and down several drainages with long steady climbs and descents. Slowly made my way to Halls Creek by mid-afternoon. Halls Creek is not much of a town. Produce in the supermarket looked sad. Phones were mostly jammed, but I found one that I could use to send out email. A number of aborigines out walking around, but not too much else. There was a small monument indicating that this part of the highway was sealed in 1986, finishing a completely sealed road through WA. There are some "wanted" posters up here for someone who abducted a tourist near Alice Springs. If I shaved my beard and got rid of the glasses, I'd look a bit like his drawing. 161 km today, 11792 km cumulative. Tailwinds! The country opened up with shorter shrubs and large grassy areas. Less hills and a good steady wind from the east. Made good progress today and could easily have kept going except for nice camp at Mary Pool. After 17 km, was a turnoff for the Tanami Road, one of the classic outback tracks. Also signs for Wolfe Crater (130 km away), world's second largest meteorite crater. Start of the track looked like a reasonable graded gravel road. Tailwinds and open country made for quick travel as the kilometers passed. Some cattle grazing along the way. Fairly quickly came turnoff to Mary Pool by 10:30 am or so. On entrance to the rest area, water overtopped the road by ~10 cm. This for a distance of ~70 meters. I took off shoes and socks and first waded across to investigate. Came back and handed my front panniers to a crossing caravan and then wheeled my bike through the water. On other side was a beautiful campground with at least 50 caravans parked. Nice relaxing along the wide river. In the afternoon, more caravaners came. I'd estimate perhaps 80 parked overnight. Walked around and talked with some of the folks, many of whom had seen me on the road, some several times. Talk of the park included the recent tourist abductions near Alice Springs and the 10 cm of rain that Broome received. Most folks don't regularly follow newspapers or news, so this "news" gets passed along by word of mouth. 107 km today, 11899 km cumulative. Original plan was to ride this distance in two days. However, early tailwinds and not much choice in campsites meant I pushed on to Fitzroy Crossing instead. Walked my bike back across the spillway, taking a second trip to fetch my front panniers. Otherwise quiet in the campground as I wheeled my bicycle out. More open terrain today, lots of shrubs and lots of grassland. Scenery was a bit repetitive though. Fortunately, an early tailwind meant I made good progress. Fuzzy caterpillars were walking across the road, I was able to miss most of them. Creeks along the way mostly dry with an occasional puddle from recent rains. At 35 km, stopped briefly for brekky of crackers and peanut butter. Driver of a road train also stopped, though he was cooking up sausages and tomatoes. Back on the road, caravans from Mary Pool were starting to pass. Several of them let out a "beep beep" or someone leaned out the window to wave. Put bicycle into higher gear and pedaled mostly flat terrain with wind from behind. At 80 km was a nice rest area (Ngumpan Cliff), though no water. Next 10 km came along some spectacular rock outcroppings. At bottom was Pinacles Creek, with water, and shortly thereafter a roadside rest for a bite to eat. Had ridden 100 km, but the roadside area wasn't too exciting, so decided to push on for a while. About 20 km further made an unfortunate discovery. My rear wheel is developing small cracks along several of the pullouts for spokes. It is a double walled wheel, so main tension is in the inner wall, not the visible cracked outer wall. I don't know how long these have been there (perhaps visible due to creek washing), but a sign this rim is wearing out. Got 60 km after discovery today, and hopefully can coax an additional 500 km to Broome. More low scrub riding along. At 130 km, the road turned slightly and felt like the wind did as well. Suddenly pushing against a head wind. Fortunately, got better at 150 km point. Rode the last 30 km slowly, but was still in Fitzroy Crossing in mid-afternoon after a long day ride. The town is remarkably spread out with supermarket a few km from the motel. Walked out for provisions and walked back. Motel is again behind a high fence with barbed wire and locks on the gates. 180 km today, 12079 km cumulative.